Today smartphones contain more sensitive and private information than ever before. Mobile Internet usage and downloads also increase every day. However, with the mobile internet usage, mobile threats targeting smartphones and tablets increase as well. As a result, Mobile Security becomes a must for every mobile user. Protecting devices with a mobile antivirus solution helps to secure and protect personal data, sensitive information and avoid mobile threats that can possibly cause you financial damage. STOPzilla offers Android users the ultimate antivirus solution for Android smartphones and tablets. The application provides users with a full-featured anti-virus, anti-malware, and remote security. STOPzilla offers users protection against malicious apps, dangerous websites, it also comes with countermeasures in order to keep important data safe. STOPzilla anti-theft features protect Android device and all the sensitive information stored, even if the device goes missing. What is more, users that use STOPzilla Mobile Security are able to clean up Android device’s memory and increase its speeds by enabling the Application Audit Feature. In addition, STOPzilla Mobile Security enables users to run a scan at any time to check if their Android device has got infected with any viruses or other malicious programs. STOPzilla Mobile Security for Android offers users a reliable and advanced AntiVirus and AntiMalware protection. STOPzilla Mobile Security applies In-The-Cloud scanning that ensures a safe internet browsing and surfing experience, blocks suspicious downloads, annoying adware and stops malicious and fraudulent applications from being installed in the system. STOPzilla Mobile Security for Android provides users with a full pack of anti-virus, anti-malware, and remote security, that ensures the complete protection of Android smartphone or tablet. What is more, this fully featured protection for your mobile device only minimally affects its battery life and system performances. As a result, users can enable STOPzilla Mobile security for Android and forget about it completely. STOPzilla Mobile Security for Android provides users with a personal internet-based security and protection portal that gives users the ability to track, locate, lock, send a message, or even erase a missing Android smartphone or tablet remotely. This way users are ensured that their sensitive and important files and data are secure and uncompromised, even if the device goes missing. It also ensures that unauthorized parties will not be provided with access to your device and information stored on it. STOPzilla Mobile Security for Android is completely supported by employees in the United States that take personal pride and ensure that STOPzilla users receive an advanced and quality security product with the best customer and technical service possible. What does STOPzilla Mobile Security offer? If your device goes missing or stolen, do not panic! STOPzilla Mobile Security anti-theft feature offers users the ability to locate, lock and wipe it remotely. Users also can message the device. 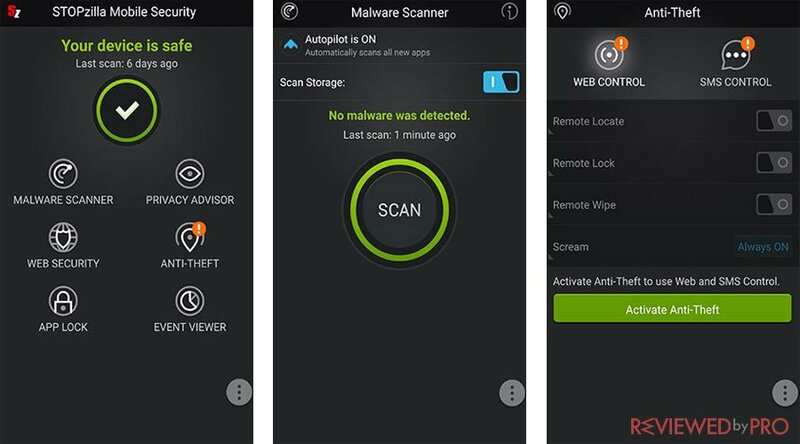 STOPzilla Malware Scanner securely scans, detects and blocks threats from the Android smartphone or tablet with minimum impact on its battery life. 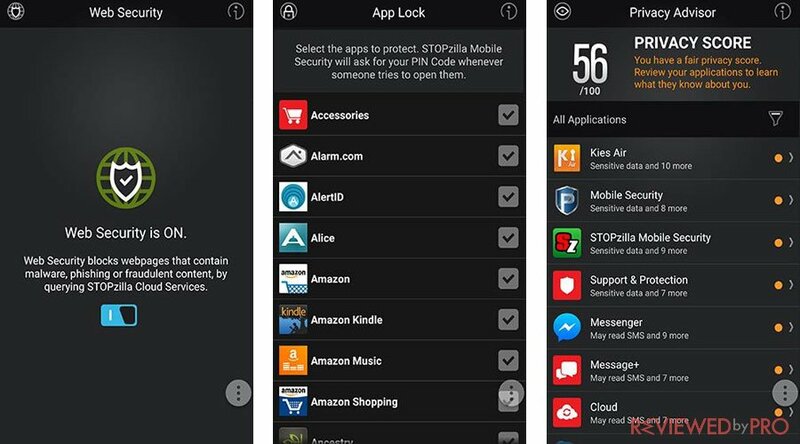 STOPzilla provides users with the App Lock feature that allows users to use a PIN code in order to lock and protect private apps and programs that might include sensitive information. This way users are able to browse and use social networks without facing any risks. STOPzilla Mobile Security for Android provides users with automatic scans that scan every single application immediately after they are installed. This way users are informed and protected when they want to try a new application. STOPzilla offers users “In-The-Cloud” scanning technology that works with your Android web browser in order to provide precautionary measures against compromising websites. STOPzilla Mobile Security keeps track of every application’s permissions requirements and displays how applications on your device are using your sensitive and private data. The Event Viewed feature keeps track of all notable actions and processes logged by STOPzilla Mobile Security antivirus for Android. STOPzilla Mobile Security enables users to run an on-demand scan whenever they want in order to ensure that all applications are installed on the Android smartphone or tablet or kept their storage valid and safe. Even though STOPzilla is not the largest internet security and antivirus provider in the market, its’ products are praised by customers. You'll never know just how easy it is to get viruses or malware on your Android phone until you have an antimalware program for it. After I downloaded STOPzilla Mobile, I realized just how many apps I download have viruses and are malicious. It has protected me from at least 20 bad apps since I've gotten it. Don't use your android without STOPpzilla Mobile! If you want to try STOPzilla Mobile Security but do not want to pay for features that you might like, STOPzilla offers users 30-day trial completely for free. So you can check out the application and its’ features before purchasing it! STOPzilla Mobile Security for Android is available on Google Play app store. STOPzilla Mobile Security for Android is compatible with Android devices that run Android 3.0 or later. Internet connection is also required for installation and updates. STOPzilla Mobile Security uses the Device Administrator permission. STOPzilla Mobile Security for Android was developed by STOPzilla, the company that operates in antivirus system and internet security software market. STOPzilla provides customers with only the best software and premium support services that safeguard its users and their technology. The company was established in 2001 as a popup blocker. Today STOPzilla is fully-fledged AntiMalware software provider that protects users against a wide variety of cyber threats and malicious programs. STOPzilla not only offers users antivirus and antimalware protection for Windows PCs, it also provides a mobile security solution for Android devices and optimization software that boost and increase device performance. ^ STOPzilla Mobile Security. STOPzilla. ^ STOPzilla Mobile Security. Google Play. This entry was posted on 2018-02-15 at 09:51 and is filed under News.